This testing can help identify transmission linkages, however determining the source of infection or direction of transmission must be accomplished through other components of an epidemiologic investigation. For investigations involving persons who inject drugs, findings of no transmission linkage should be interpreted with caution because each time needles or other injection equipment are shared, new HCV strains can be introduced in the drug user which might obscure evidence of past linkages. 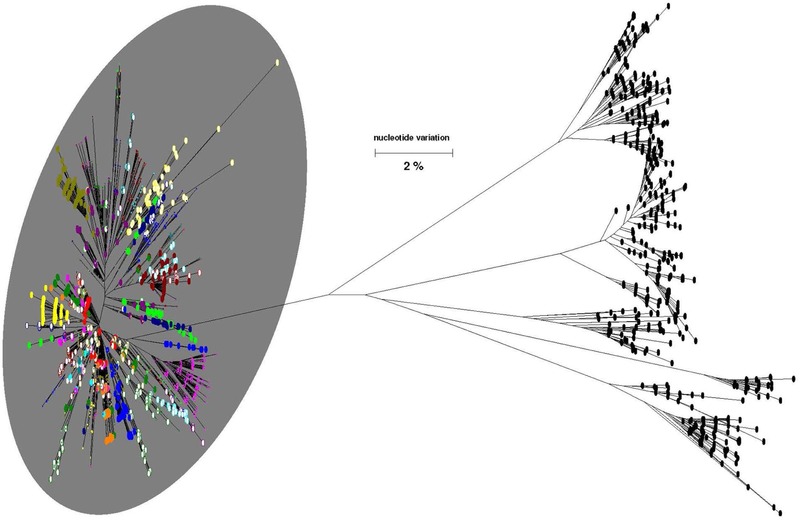 In phylogenetic tree reports each color (and randomly assigned case number if included) represents someone infected with hepatitis C virus. Multiple dots of the same color indicate different quasispecies from the same patient’s sample. Dots on the tree representing samples linked by transmission are enclosed in a grey circle. For patients not linked by transmission (those outside of the grey circle), this testing did not find a degree of genetic relatedness above the transmission criteria threshold. Each patient is represented by a circle of smaller or larger size in proportion with the diversity of virus in that patient’s sample. Pairs or clusters of transmission-linked patient samples are linked by bars. Read more about GHOST at: HHS Ventures Team Helps Detect Disease OutbreaksExternal, GHOST Makes Connections in Hepatitis C Virus Transmission.